Please note: This exact box has already been sold, however Ms. Smirnova has graciously agreed to do a similar one. Some of the details may be slightly different, but the composition and spirit of the piece will remain the same. Depending on her work load, the normal time frame for this will be 3-6 months. She will be painting it just for you, and will allow the possibility for a minor change in the box should you desire one. We will guarantee that it will look as good or better than the one here. The box will come with exquisite side ornamentation, though we do not have a side picture of this box to show you. If you are not happy with the box you receive for any reason, we will gladly refund the total amount paid. A down payment of 50% will be required for her to start work. "The Golden Bird", a fairy tale by the Brothers Grimm, is depicted in this box by Palekh artist Vera Smirnova. (You can read the fairy tale here on wikipedia). 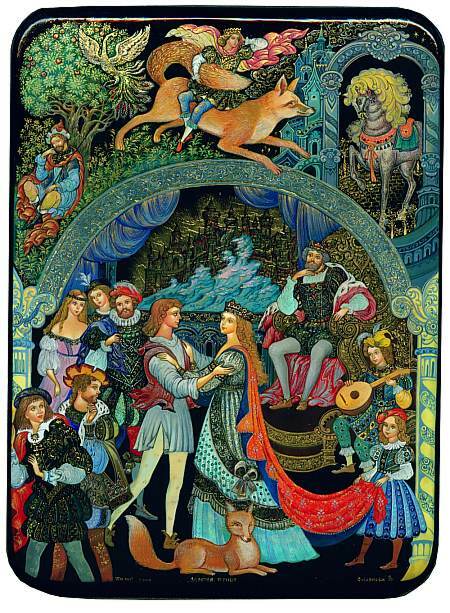 It is always interesting to compare the Russian fairy tales to western ones, and this story has elements very similar to "Ivan Tsarevich, the Firebird and the Gray Wolf". 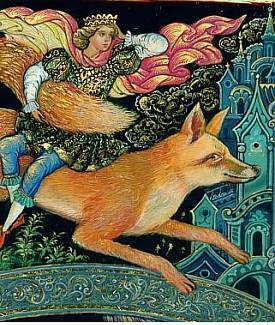 But there are big differences, too, like the wolf in the Russian version is a fox in "Golden Bird", and turns into a handsome prince, too. The composition is very lovely here and one can sense the gold leaf in this one (in the clothing, throne, background and bird itself) is really quite dazzling. This is something that this artist is known for, and if you come to our gallery we can show you just how special her talent is in this area.